For the first time, I celebrated my birthday outside the bounds of Metro Manila. It was an action-packed 20th birthday trip (thanks to my ka-lakwatsas). Part of this weekend adventure was to traverse Mt. 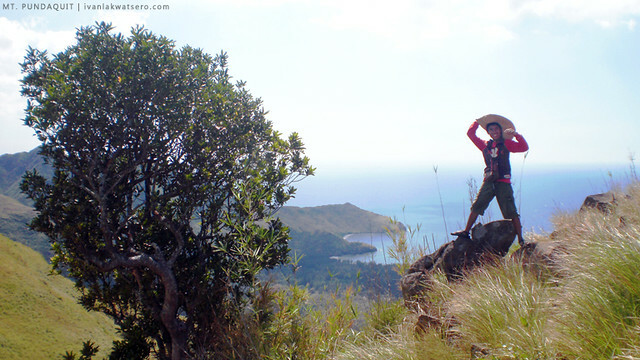 Pundaquit (my third mountain) to Anawangin Cove. Three hours after boarding Victory Liner's earliest trip to Sta. 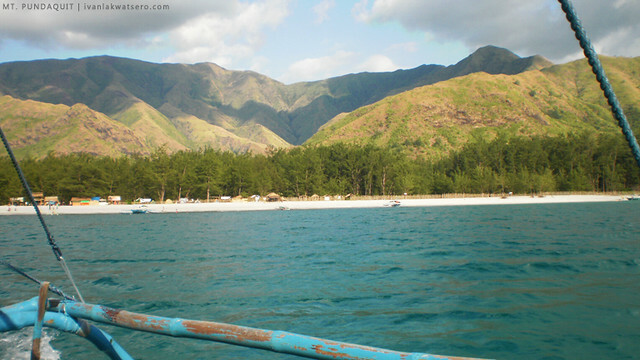 Cruz, Zambales (04:00 am), I, together with a bunch of adventure-loving friends, arrived at San Antonio - home of Zambales' famous coves and island beaches. As soon as we alighted the bus, Mang Mike, our contact in Brgy. Pundaquit, waved and called our attention. He already hailed three tricycles that will bring us to Brgy. Pundaquit, the main jump-off point to our first destination - Mt. Pundaquit. Our plan was to eat first our breakfast then buy all the necessary stuff for our overnight camping - food, drinks, coal, etc. - at San Antonio Market before we proceeded to Brgy. Pundaquit. Having no choice, the tricycle drivers waited for us for more than an hour (tricycle regular rate is P30 per head, we paid an additional amount because we made them wait for us for more than an hour). 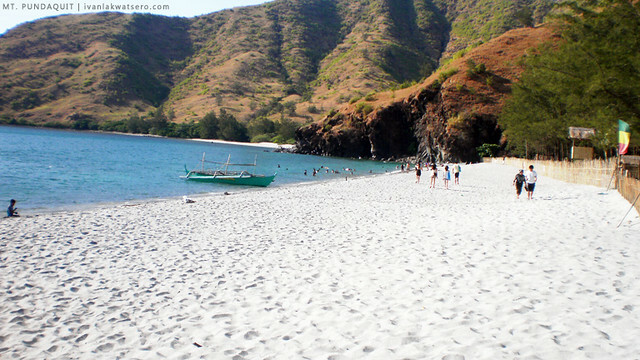 Anawangin Cove is accessible by boat or by foot. Most tourists would opt the boat since it's just 30 minutes away from Pundaquit beach. 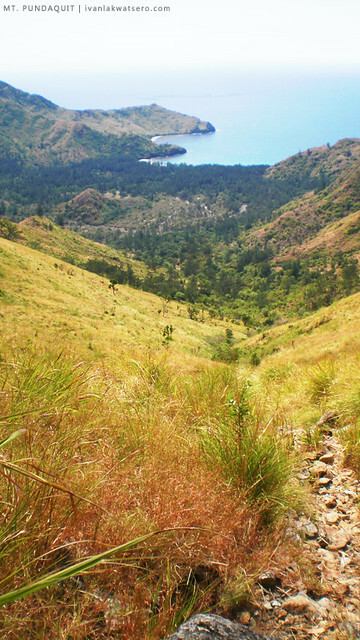 The longer and rougher way to Anawangin is by foot through the mountain of Pundaquit, mountaineers and adventure-loving trippers are the usual trampers of this path. 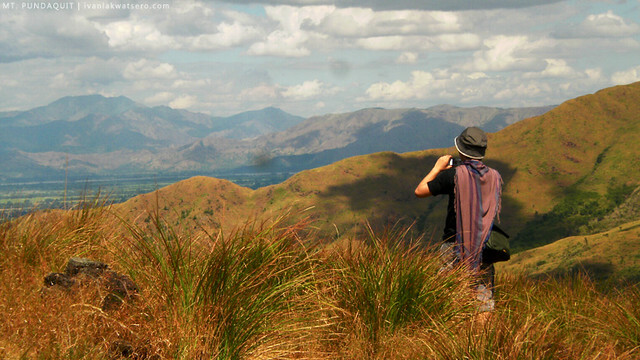 It's strenuous, time consuming (4-5 hours trek), and might test your physical abilities, but I swear, you'll feel no regrets upon reaching the mountain's summit. 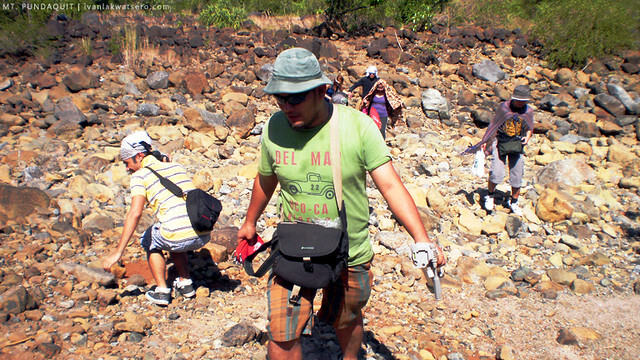 We reached Pundaquit Beach at around 9:30 am, and at 10:00 am, we started the long trek to the mountain. 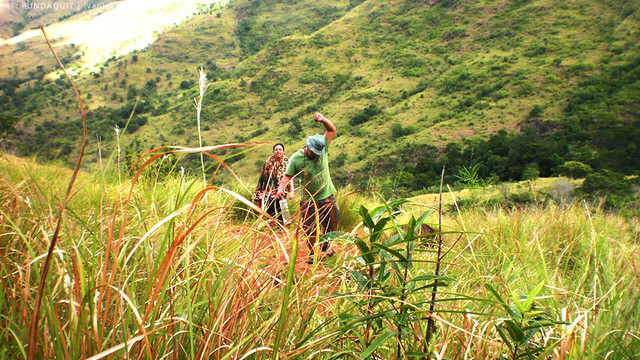 A guide, contacted by Mang Mike, served us in this 5-hour trek (P100 per head). 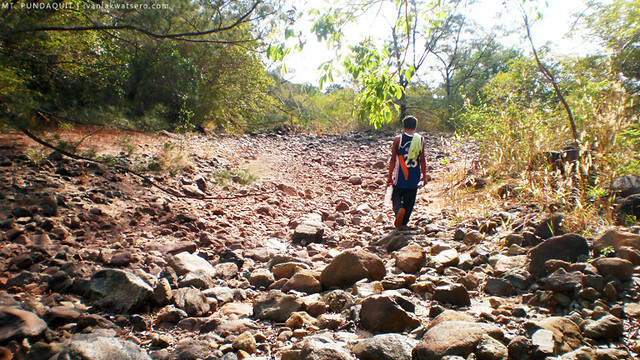 A 45-minute trek from the Barangay Hall (registration) led us to the foot of Mt. Pundaquit. We passed through a lahar field and a dried-up river (raging if wet season). From time to time, I was awed by the landscapes that we pass by. We also passed by a stream of drinkable water. We started the ascent just a few minutes before 11:00 AM (imagine the mid day sun striking above us). It was pretty hot the entire time we're doing the trek. Good thing we had our heavy bags loaded on the boat which went ahead to Anawangin. The only antagonist we faced in this climb is probably the mid day sun and the limited water we brought with us. hiding under the shade of the tree. Three among the group were first time hikers, so we're stopping for like every 5 minutes (haha, I know what they were feeling, because I felt the same thing during my first climb). I learned from my last climb how to control my breathing and pace so climbing a 3/9 mountain isn't much a problem to me anymore. Within an hour and 30 minutes, the summit was already at our reach. It was bit windy but the sun was striking badly upon reaching the summit at around 12:30 PM. 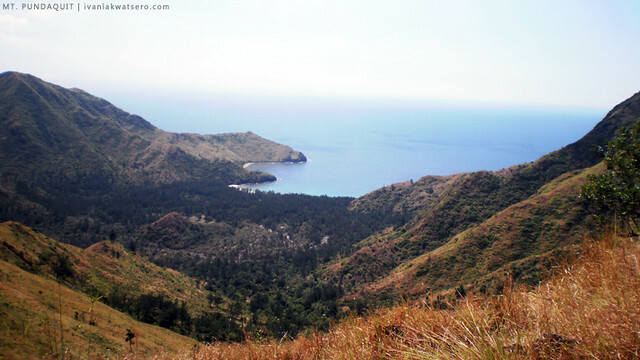 Viewed from the top was the whole Anawangin Cove and nearby mountain ranges, everything was pleasing to the eyes. 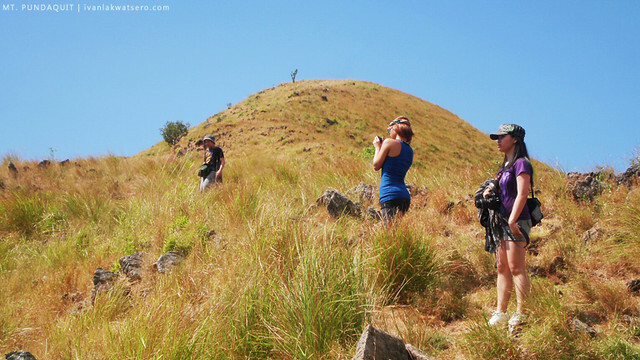 We spent 30 minutes on the summit taking pictures, feeding our eyes with awesome views and relaxing under the shade crafted by our guide. 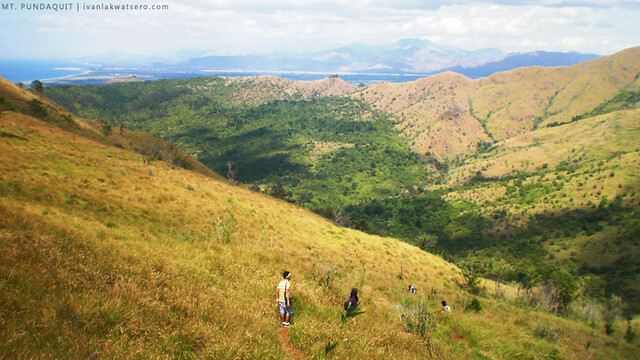 We wanted to stay longer on top but we just had to descend or else we'll end up like raisins because of dehydration. 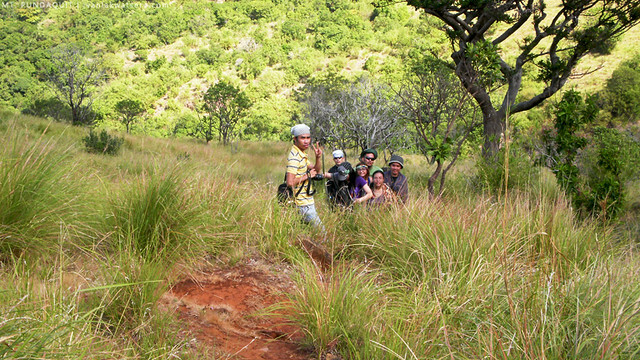 Our guide told us that there's a fresh water source about an hour from the summit so we hurried to reach that spot. The descent was easier, although it's steeper. We trekked much faster because of the view of Anawangin Cove, like an oasis in the middle of a desert, was a great motivation. Rocks, not so large, constantly block the clear trail so we needed to hop, stride and hop again. After an hour of trekking down from the summit, we reached the fresh water source, our guide filled our bottles with clear potable water. Rejuvenated by the fresh water, we continued the trail (now 45 minutes away) to Anawangin. At 02:45 PM, our feet touched the ground again. 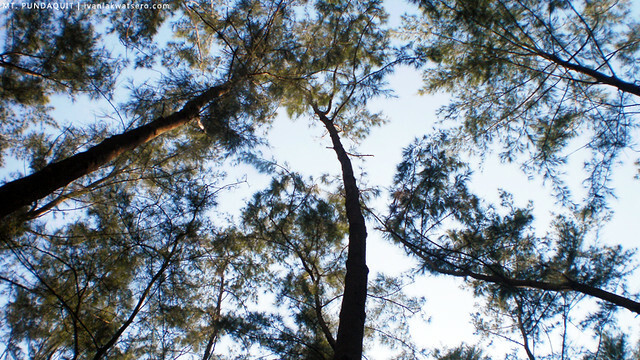 From hereon, we passed through a dry riverbed, a maze of canopies (pine trees), and finally the fine sand of Anawangin Cove. 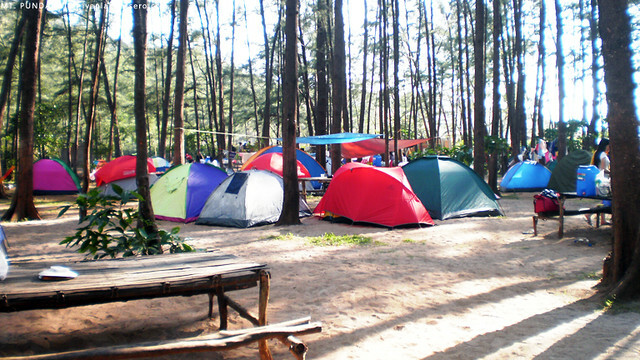 A lot of tents and hammocks, probably a few inches away from each other, greeted us when we arrived at Zambales' most famous cove. 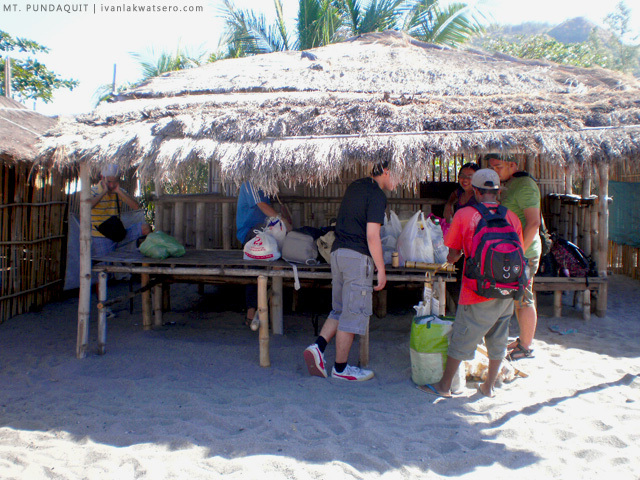 The popularity of Anawangin Cove was evident in this seemingly "squatter's area". After the obligatory window shot, we went straight to the local store who sells ridiculously over-priced products. A bottle of C2 costs P40. Oh well, that's the consequence of Anawangin's seclusion. Our boat, with our bags and goods, was already waiting for us at the beach, so after a few snapshots of the Anawangin Cove, we jumped into the boat and off we went to Nagsasa Cove. Medyo busy ka yata `cos ngayon mo lang napost `to. Oh sheet 20 ka pa lang? Mas younger ka pa pala sakin. I`ll include "to climb Mt. Pundaquit" as one of my to-do things next year. Lols. Grabe ang congested na nga ng mga tents sa Anawangin. So which is better overall, Anawangin or Nagsasa? oo nga e. haha. andaming gawaing pang eskuwela. lol mas bata nga ako sayo. goodlak on your trip. say hi to Mang Mike for me. Okay Ivan - I will tell him hi for you! :-) did you contact him before your trip? yes. kontakin nyo sya lagi. sabihin nyo kung malapit na kayo sa San Antonio. he'll welcome you. Hi Paula and Ivan, can I get the contact # of Mang Mike? 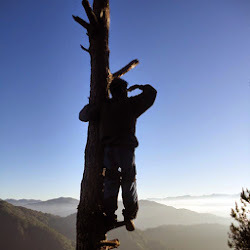 Isn't it better to start your climb before the sun comes up to minimize your exposure to the heat ? Why not buy your needed supplies before you leave the city ? It is probably cheaper there, unless of course, you want to support the local economy. Keep climbing! it would be impractical to by goods at the city, masyadong bulky dalhin. same lng naman yung prices and it will add more experience, feel the local life. i almost decided to join this trek if not of the tiring week. sure is rewarding. 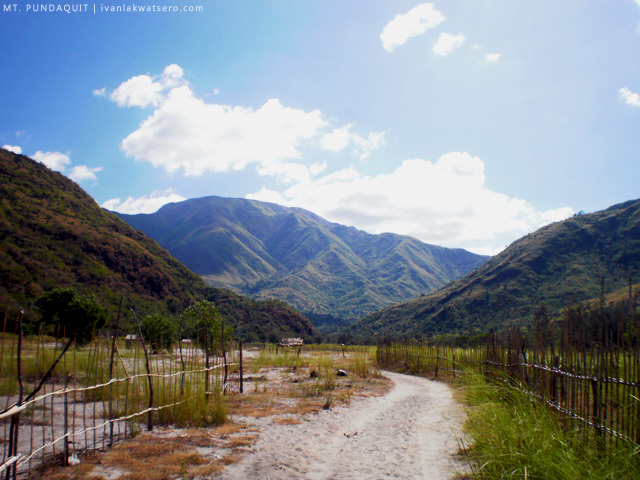 mountains of zambales remains to be among my favorite. nakakapagod man pero kung ganito nga ka ganda. sulit pa din. mgkno inabot ng travel nio sa zambales?? Ganda! Dapat pala sumama ko! pwede ba ang bata d2 or pang adult lang. thanks. ride either Sta.Cruz-Bound bus or Iba-bound bus. both will bring you directly to San Antonio Zambales. anyone interested to (day) climb with me this wednesday? since i'm from olongapo city (45 mins. to san antonio) i plan to be at san antonio at 4:30 am to start trekking around 5am to avoid the scorching heat of the sun. i already have a contact to guide us. let me know if you are interested. >>>>P1200/head minimum of 12pax and above..
FOR MORE INFO look for ALAN ARLANTICO: Smart: 09185595597 or 09399398456TM: 09358118095 Sun: 09223753555 please TExt or call for immediate response..
ask ko lang po magkano costing nyo per head? Is there anyone here planning to traverse either Mt. Pundaquit or Mt. Nagsasa this coming months? 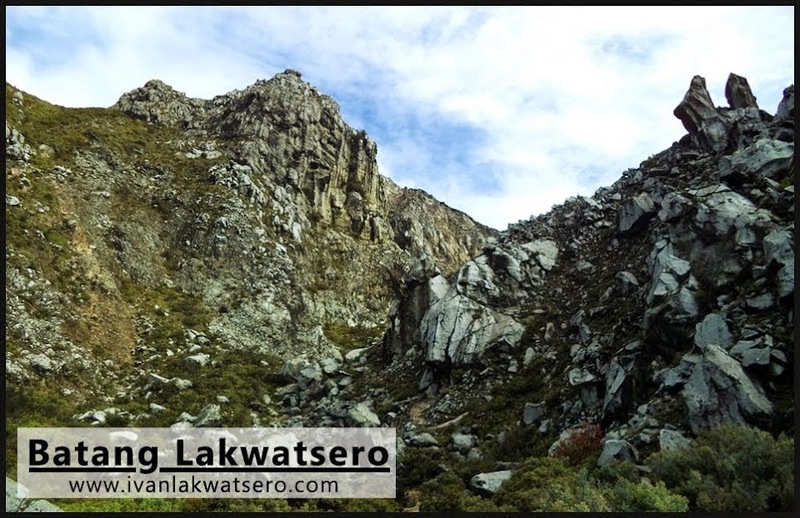 tanong ko lang kung sino yung guide nyo sa trekking? may contact number ka? salamat.. Hi!! Pwede ko po ba malaman yung number ni Mang Mike? Balak po kasi namin pumunta this weekend. Hi! Pwede makuha contact number ni Sir Mike? Thank you!